Now that Christmas is over, and my last-minute crafting craziness is almost* finished, I can look back on the gifts I made. As usual, many of the gifts were knitted. Warm knitted things just seem like a natural gift in December... However, I did make some necklaces for the 5 nieces and earrings for some of the women in my family. Ribbed Hat and Scarf Set - "Vogue Knitting: Accessorize"
I decided to use the skeins of Manos of Uruguay wool I had on hand. It was a blend of brown, red, yellow, and certainly manly enough for my dad. 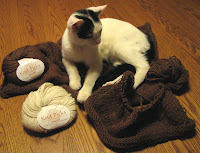 I went with a simple pattern that would knit up quickly and show off the beauty of the yarn. The nicest thing about this project was that I used yarn I bought last summer at Belle Valee' Woolen Mill in northern Ontario (near our family cabin). That made it pretty special. I was not completely happy with the pattern -- it ended up deeper than I thought a tote bag should be, and the straps didn't felt quite as well as I hoped so they were a little long. But it's still a nice, useful tote bag for my aunt. 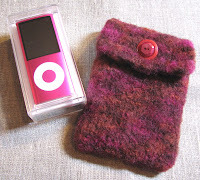 When I fou nd out that my sister was getting a pink iPod for Christmas, I knew I needed to make her a cozy to keep it safe in her purse. 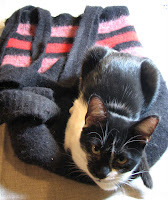 This knitted up really quickly -- it took much longer for it to dry after felting than it did to make it. I used two vintage buttons to pick up the colors in the yarn. This one is still in progress. Yes, it was completely unreasonable for me to think I could knit a sweater for a 6'3" teenager in one weekend. Sheesh! So I'm currently working on it. The boy has been wanting a Weasley sweater for a while now -- I ho pe to get it done soon.